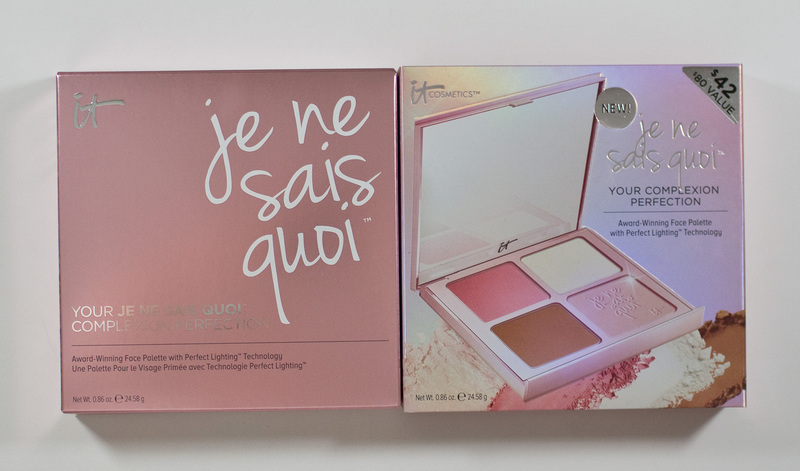 The it Cosmetics Je Ne Sais Quoi Your Complexion Perfection Face Palette retails for $42US and $55 CAN for 0.86 oz / 24.58g of product. 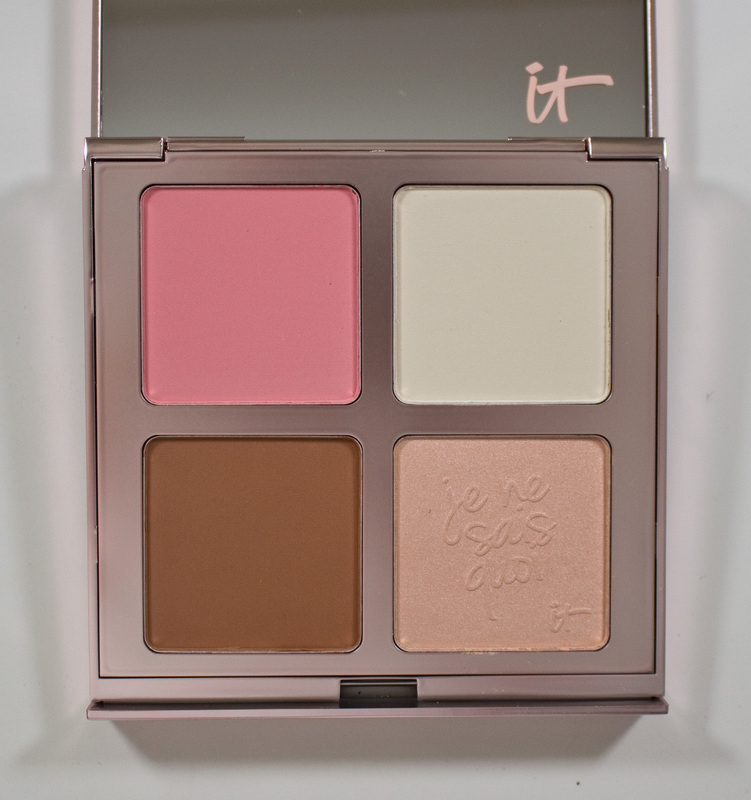 it Cosmetics Je Ne Sais Quoi Your Complexion Perfection Face Palette, box and outer sleeve front. 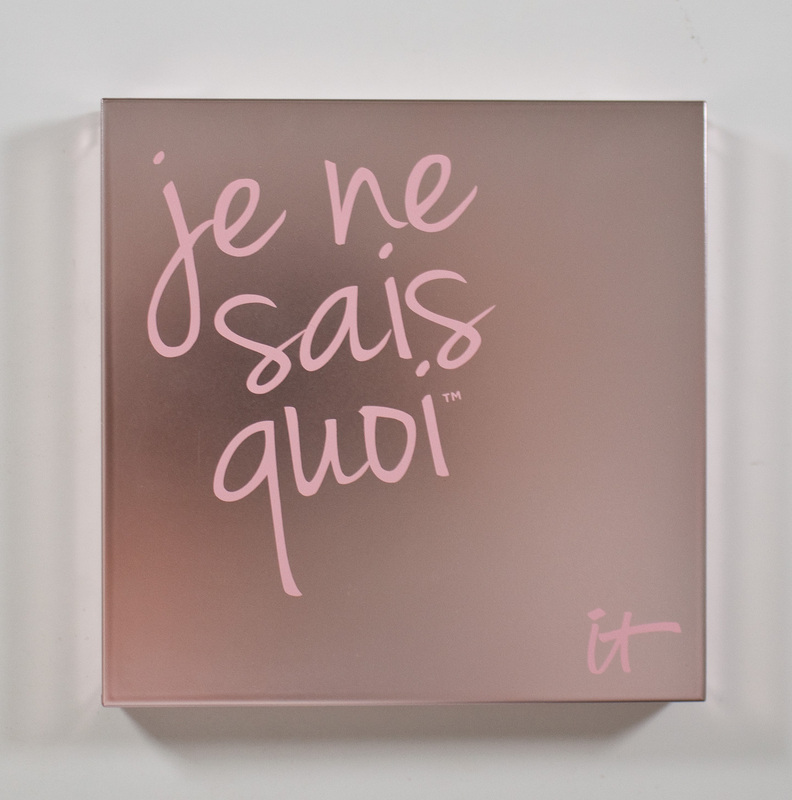 it Cosmetics Je Ne Sais Quoi Your Complexion Perfection Face Palette, outer sleeve and box side. it Cosmetics Je Ne Sais Quoi Your Complexion Perfection Face Palette lid. it Cosmetics Je Ne Sais Quoi Your Complexion Perfection Face Palette in: Bye Bye Pores Blush in Je Ne Sais Quoi, Bye Bye Pores Pressed Poreless Finish Airbrush Pressed Powder in Translucent, Sunshine in a Compact Matte Bronzer in Warmth, & Perfect Lighting Luminizer in Je Ne Sais Quoi. BLUSH: MICA, DIMETHICONE, MAGNESIUM STEARATE, PHENOXYETHANOL, TOCOPHERYL ACETATE, RETINYL PALMITATE, TOCOPHEROL, HYDROLYZED COLLAGEN, ASCOBYL PALMITATE, HYDROLYZED SILK, NIACINAMIDE, AQUA/WATER/EAU, GLYCERIN, STEARETH-20, N-HYDROXYSUCCINIMIDE, CHRYSIN, PALMITOYL OLIGOPEPTIDE, PALMITOYL TETRAPEPTIDE-7, CAMELLIA SINENSIS LEAF EXTRACT, HELIANTHUS ANNUUS (SUNFLOWER) SEED OIL, VITIS VINIFERA (GRAPE) SEED EXTRACT, ALOE BARBADENSIS LEAF EXTRACT, MAGNESIUM ASCORBYL PHOSPHATE, CHOLESTERYL OLEYL CARBONATE, CHOLESTERYL NONANOATE, CHOLESTERYL CHLORIDE, SODIUM HYALURONATE, EUTERPE OLERACEA FRUIT EXTRACT, [+/-: TITANIUM DIOXIDE (CI 77891), IRON OXIDES (CI 77491, CI 77492, CI 77499), ULTRAMARINES (CI 77007), RED 7 LAKE (CI 15850), RED 6 (CI 15850)]. FINISHING POWDER: MICA, DIMETHICONE, MAGNESIUM STEARATE, PHENOXYETHANOL, TOCOPHERYL ACETATE, HYDROLYZED COLLAGEN, ASCORBYL PALMITATE, HYDROLYZED SILK, NIACINAMIDE, ALOE BARBADENSIS LEAF JUICE, MAGNESIUM ASCORBYL PHOSPHATE, AQUA/WATER/EAU, CAMELLIA SINENSIS LEAF EXTRACT, CHOLESTERYL OLEYL CARBONATE, CHOLESTERYL CHLORIDE, CHOLESTERYL NONANOATE, CHRYSIN, EUTERPE OLERACEA FRUIT EXTRACT, GLYCERIN, HELIANTHUS ANNUUS (SUNFLOWER) SEED OIL, N-HYDROXYSUCCINIMIDE, PALMITOYL OLIGOPEPTIDE, PALMITOYL TETRAPEPTIDE-7, RETINYL PALMITATE, SODIUM HYALURONATE, STEARETH-20, TOCOPHEROL, VITIS VINIFERA (GRAPE) SEED EXTRACT, [+/-: IRON OXIDES (CI 77492)]. BRONZER: MICA, DIMETHICONE, MAGNESIUM STEARATE, PHENOXYETHANOL, TOCOPHERYL ACETATE, CHOLESTERYL OLEYL CARBONATE, CHOLESTERYL NONANOATE, CHOLESTERYL CHLORIDE, RETINYL PALMITATE, TOCOPHEROL, MAGNESIUM ASCORBYL PHOSPHATE, HYDROLYZED SILK, HYDROLYZED COLLAGEN, GLYCERIN, AQUA/WATER/EAU, EUTERPE OLERACEA FRUIT EXTRACT, BUTYLENE GLYCOL, CAMELLIA SINENSIS LEAF EXTRACT, CARBOMER, POLYSORBATE 20, PALMITOYL OLIGOPEPTIDE, PALMITOYL TETRAPEPTIDE-7, VITIS VINIFERA (GRAPE) SEED EXTRACT, ALOE BARBADENSIS LEAF EXTRACT, HYALURONIC ACID, [+/-: IRON OXIDES (CI 77499, CI 77492, CI 77491)]. LUMINIZER: MICA, DIMETHICONE, MAGNESIUM STEARATE, PHENOXYETHANOL, TOCOPHERYL ACETATE, RETINYL PALMITATE, TOCOPHEROL, MAGNESIUM ASCORBYL PHOSPHATE, HYDROLYZED SILK, HYDROLYZED COLLAGEN, GLYCERIN, AQUA/WATER/EAU, EUTERPE OLERACEA FRUIT EXTRACT, BUTYLENE GLYCOL, CHOLESTERYL OLEYL CARBONATE, CHOLESTERYL NONANOATE, CHOLESTERYL CHLORIDE, PALMITOYL OLIGOPEPTIDE, PALMITOYL TETRAPEPTIDE-7, CARBOMER, POLYSORBATE 20, VITIS VINIFERA (GRAPE) SEED EXTRACT, ALOE BARBADENSIS LEAF EXTRACT, HYALURONIC ACID, CAMELLIA SINENSIS LEAF EXTRACT, [+/-: TITANIUM DIOXIDE (CI 77891), IRON OXIDES (CI 77499, CI 77492, CI 77491), MICA (CI 77019), RED 7 LAKE (CI 15850)]. All three products have a similar formula. The base colours are a satin matte with micro shimmer and texture wise they apply smoothly to the skin. 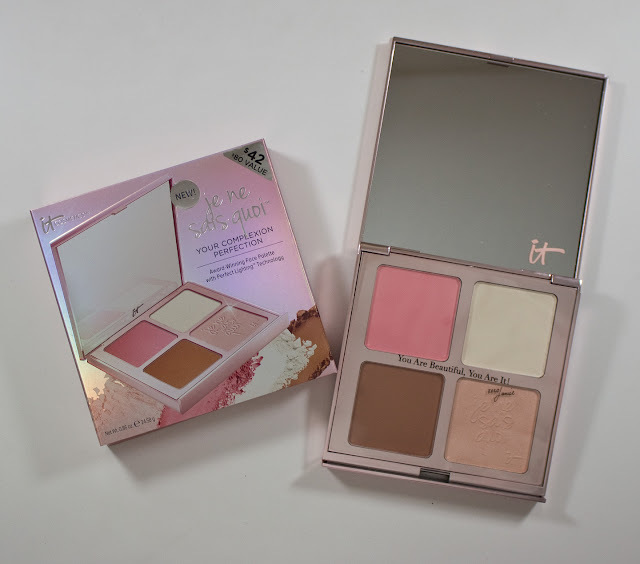 Bye Bye Pores Blush in Je Ne Sais Quoi and the Sunshine in a Compact Matte Bronzer in Warmth are both a matte finish powder that is silky to work with can be built up. 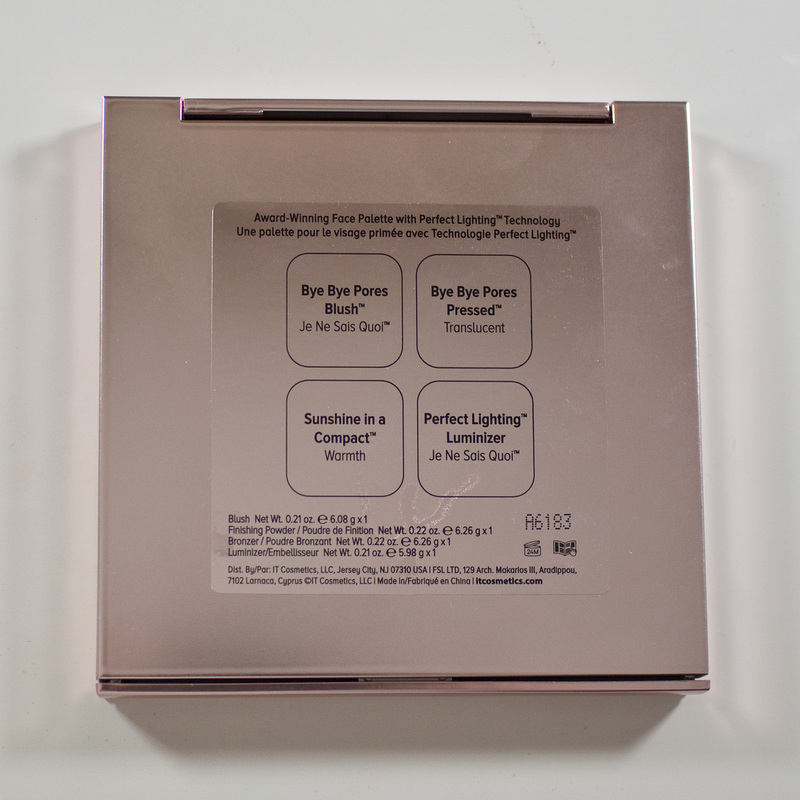 Bye Bye Pores Pressed Poreless Finish Airbrush Pressed Powder in Translucent is a sheer powder that blurs skin texture slightly that makes it a nice setting powder. Perfect Lighting Luminizer in Je Ne Sais Quoi is a shimmer finish highlighter that is smooth to apply and smooth looking on the skin. 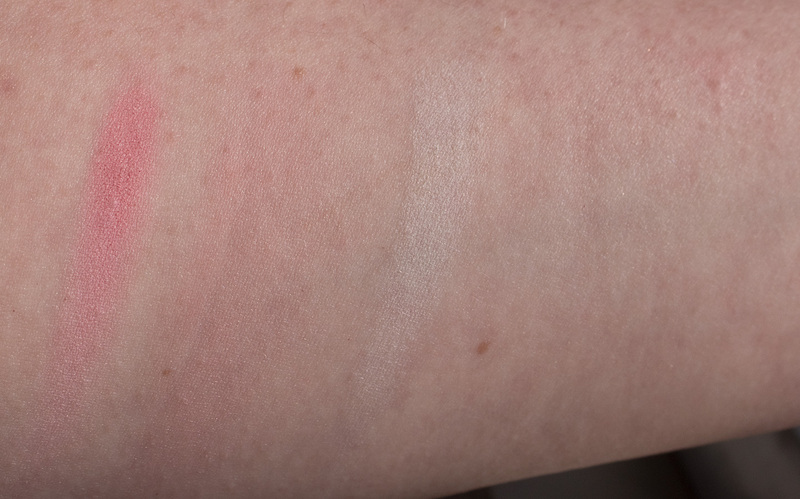 Bye Bye Pores Blush in Je Ne Sais Quoi is a bright light pink with a matte finish. 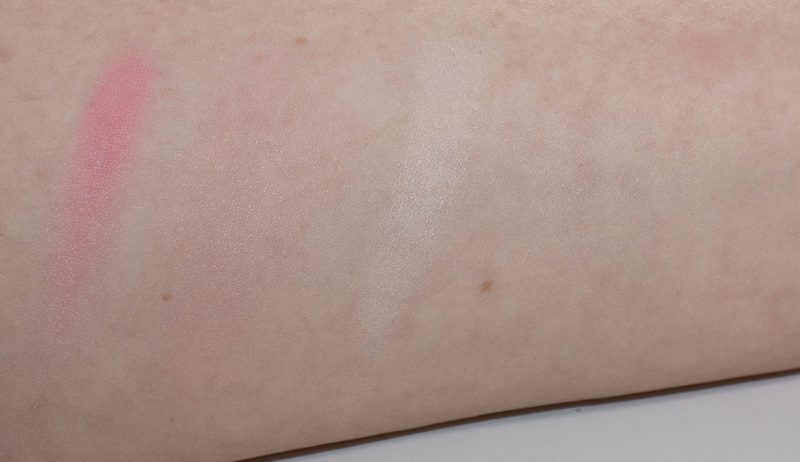 Perfect Lighting Luminizer in Je Ne Sais Quoi is a pale pink beige with a shimmer finish. 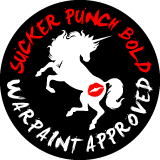 Wear: This formula does last on me for 12 hours days. 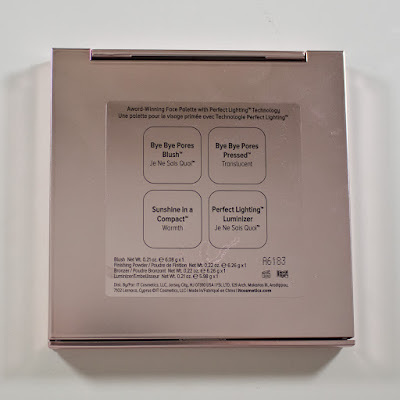 Packaging: Is a brushed pink metal compact with a push bar opener for the palette, I have a full life mirror, and the lid can stand up on a table. Daylight swatches: Bye Bye Pores Blush in Je Ne Sais Quoi & Bye Bye Pores Pressed Poreless Finish Airbrush Pressed Powder in Translucent. Applied heavily and buffed out. Flash swatches: Bye Bye Pores Blush in Je Ne Sais Quoi & Bye Bye Pores Pressed Poreless Finish Airbrush Pressed Powder in Translucent. Applied heavily and buffed out. Daylight swatches: Sunshine in a Compact Matte Bronzer in Warmth, & Perfect Lighting Luminizer in Je Ne Sais Quoi. Applied heavily and buffed out. Flash swatches: Sunshine in a Compact Matte Bronzer in Warmth, & Perfect Lighting Luminizer in Je Ne Sais Quoi. Applied heavily and buffed out. 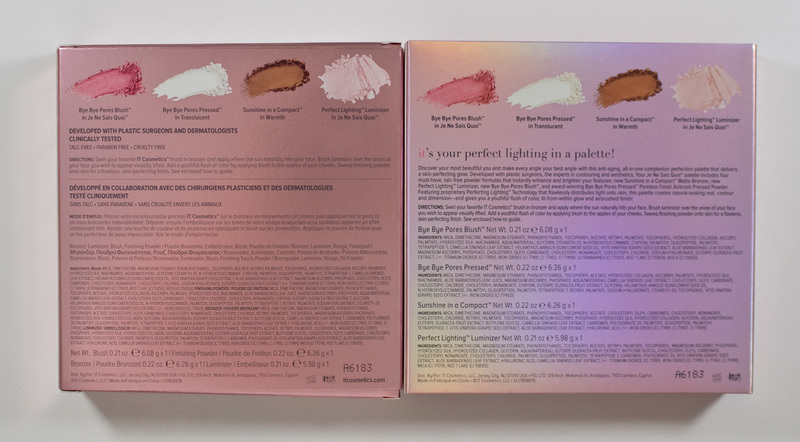 It's a nice palette for fair to light-medium skin tones, but it doesn't entirely work for my pale complexion with the bronzer turning orange on me. And I can't see it working for those that are medium to deep because the setting powder can leave a cast on the face in this pressed form compared to the original loose powder.